In this 4 minute video, we speak with Bill Metropol of Fibrenew Marietta. 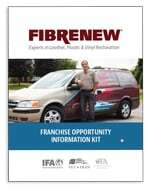 Bill purchased his Fibrenew Franchise in 2008. Prior to starting his business, Bill worked in the technology industry for over 25 years – a majority of which with Hewlett Packard / Compaq. Today, he operates a booming mobile service business in northwest Atlanta that caters to each segment of the market that Fibrenew reaches.